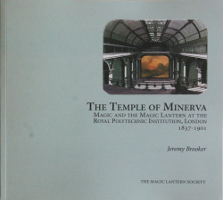 The Temple of Minerva is a book about a particular building and its importance in the history of cinema, stage illusion and the magic lantern. The building once known as the Polytechnic Institution in Upper Regent Street has seen many alterations over its 175 years, reflecting changes in the institutions occupying it and in the nature of entertainment and education. But it was once a familiar London landmark and a popular destination for visitors to the metropolis. Jeremy Brooker tells the Polytechnic’s story in an engaging and readable style, based on the latest historical research, with a rich selection of 80 contemporary illustrations. In doing so he focuses on three of the most significant optical devices of the whole Victorian era: dissolving views, ‘Pepper’s’ ghost illusion and the Cinématographe, all inextricably linked to the evolving physical nature of this one building. This approach reveals the Polytechnic as a far more intriguing and complex entity than has generally been acknowledged, and also offers new ways to consider ‘pre-cinema’ devices and the other institutions which existed in the interface between science and spectacle in Victorian London. The Temple of Minerva is one of the definitive works on this fascinating institution and its impact on visual media and 19th-century culture.